The STP pump series manufactured by SABI includes three sizes of high pressure triplex reciprocating power pumps, specifically designed for heavy duty service. Sabi serves successfully any OEM pertaining to industries requesting heavy duty services for which off-the-shelf pumps are not adequate. 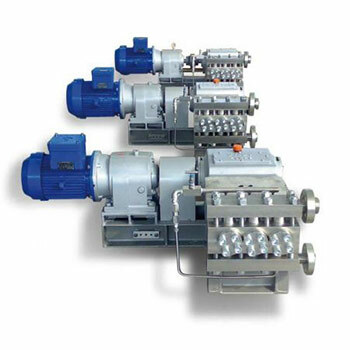 The design of all the pumps, conceived for medium and high pressure, takes care of the problems connected with each application and offers several options in terms of hydraulic end materials, sealing systems and valves arrangement. The pumping units are supplied in accordance with the Customer specifications and are complete of all the requested accessories like safety valves, check valves, pulsation dampeners, electric motor and control panels.